So beautiful and delicate piece of work, Lois! Wonderful rendering! Best wishes! Oh such a beautiful rose, little drops of dew and all! Excellent lighting and contrast! Donna, thank you!!! I'd almost forgotten about this one ... so happy you enjoyed it!!! I love the way you've manipulated this one. Beautiful! Lois, this is so delicate and lovely, a beauty! v/f. 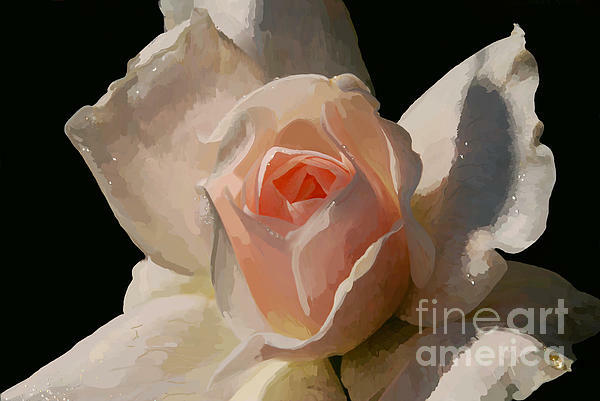 Beautiful rose painting. Evidently roses are a popular subject! 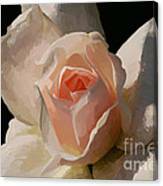 I just sold an original rose painting today in a gallery. 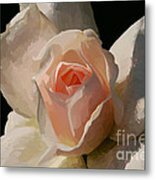 Your painting is very realistic and I like the delicate pink/peach colors. Voted! Thank you Julie .. and a very happy congratulations to you on your sale!!!!! That's always fabulous news to hear!!!! Beautiful delicate Rose. This one has my vote. Phyllis, thank you so very much!!!!!! thank you so so so much!!!!!!!!!! Jose, thank you again for the feature in "Stop Time With Art"!!!!!! So happy you enjoyed this one!!!!! Thank you, Sandi for the feature in your wonderful group "Beauty of the World"!!!! A very late thank you to Cassandra, Deb and Marsha!!!! And a big thank you to Madalena for the honor of a feature in your beautiful "Female Artists - Creative Women" group!!!!!!! NOTE: FINE ART AMERICA WATERMARK WILL NOT APPEAR ON PURCHASED IMAGE. A dewy rose from my garden. 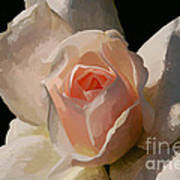 Actually a white rose, sometimes there are tones of pinks in the centers. Digital image hand painted completely in Corel Painter 11 from an original photograph captured with the Nikon D40x.